Pakistan's PM Shahid Khaqan Abbasi approved a proposal sent to the PM’s office by the defence ministry. Pakistan Prime Minister Shahid Khaqan Abbasi has approved a proposal to increase the number of civilians in the senior hierarchy of the country’s powerful spy agency, Inter-Services Intelligence (ISI). 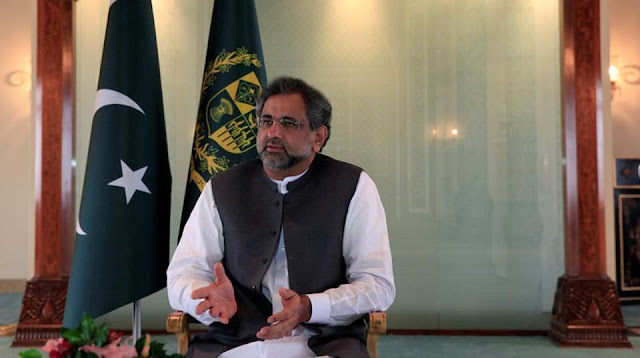 Abbasi on September 15 approved the proposal to increase the number of directors general (DGs) -- the highest civilian post in the agency -- from one to four, Dawn reported on Sunday. The post of a civilian DG in the ISI is a grade 21 position, equivalent to a serving major general of the armed forces. Previously, there was only one civilian DG post in the intelligence agency. Abbasi approved the summary sent to the PM’s office by the defence ministry, proposing four civilian DGs in the ISI. In addition, the Prime Minister also enhanced the number of deputy directors general (DDGs) from eight to 15. The same summary recommended the creation of seven additional DDG posts for civilian officers in grade 20. “The Prime Minister has seen and is pleased to approve the proposal at para 5 read with the views of Establishment Division and of Finance Division,” according to the office order issued by the PM’s office on September 15. Raja Javed Ikhlas, parliamentary secretary for the cabinet and establishment division, termed the order “a routine matter”. An official of the military’s media wing -- Inter-Services Public Relations -- did not comment on the development, but said that since the Prime Minister was the competent authority, as the ISI worked under the PM Secretariat, it was his prerogative to increase the sanctioned posts in the agency. Formed in 1948 as an independent unit to strengthen the country’s intelligence network, ISI was formerly part of the Intelligence Bureau (IB), which handled intelligence-sharing between different branches of the military, as well as external intelligence gathering. Its headquarters was initially located in Rawalpindi, but was later moved to Islamabad. In 1950, ISI was officially given the task of safeguarding Pakistani interests and national security, inside and outside the country. During the Soviet-Afghan war, ISI was strengthened and re-organised, with a handful of posts being created for civilians from the Defence Intelligence Services (DIS) cadre. According to a former ISI official, it was in 2005 when Gen Pervez Musharraf approved the posting of a civilian as DG ISI in grade 21 for the first time. The process for the promotion of civilian ISI officers was slow, since there was only one DG slot, he said. However, with the addition of seven grade 20 and three grade 21 posts, the official hoped that promotion of civilians, especially young DIS officers working in “hard areas”, would be accelerated. In June 2013, some ISI officials had petitioned the Islamabad High Court against the slow pace of their promotions. The petition stated that there were over 300 officers in grade 17 to 21 in the five cadres of the ISI, including the surveillance (field intelligence) cadre, vetting cadre, joint intelligence miscellaneous cadre, ministerial cadre and DIS. The petition was dismissed by IHC Chief Justice Mohammad Anwar Khan Kasi in September the same year, saying that the aggrieved officials should approach the Federal Services Tribunal, which was the relevant forum for such petitions.